Mohalla Clinics are primary health centres in the state of New Delhi in India that offer a basic package of essential health services including medicines, diagnostics, and consultation free of cost. Mohalla in Hindi means neighborhood or community. These clinics serve as the first point of contact for the population, offer timely services, and reduce a load of referrals to secondary and tertiary health facilities in the state. The Aam Aadmi Party government in Delhi is making unprecedented strides in enhancing people’s access to quality healthcare. The government has launched several schemes to provide free medicines, tests, and several life-saving surgeries through a three-tiered network of Mohalla Clinics, Polyclinics, and Hospitals. 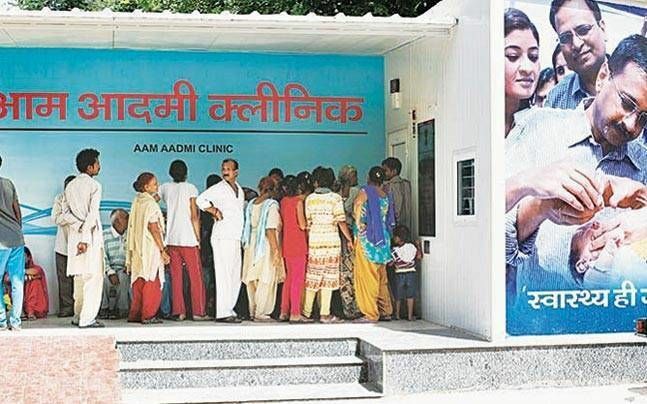 The Aam Aadmi Party’s flagship mohalla clinic project is one of the vital healthcare models that is being keenly watched. The USP of these clinics is their location in neighbourhoods, consultation charges of just Rs.30 footed by the government and free diagnostic tests. At a time when health care expenses are skyrocketing, and routine illnesses like fevers are leaving poor people indebted, the mohalla clinic also becomes an important social security scheme. Though 189 such clinics are functioning, AAP had promised 1000 functional clinics. Every mohalla clinic has a doctor, a technician for uploading patients’ Aadhaar details and a lab assistant for collecting blood samples and disbursing medicines. The clinic works from 8 AM to 2 PM. The concept of Mohalla Clinics partially originated from the traditional approach of Mobile Medical Units (MMU) or Mobile Vans. These MMUs exist across almost all districts of India as well as in other parts of the world. The mobile vans as clinics provide health services in underserved areas, bringing doctors and other staff along with medicines and supplies to people through a suitably modified/adapted Tempo or different types of vehicles. In early 2014, then elected AAP-Congress coalition government in Delhi decided to rapidly expand the network of MMUs in the state with the launch of a few additional MMUs. Initially, the key difference from earlier approach was that state governments usually seek funding from Union Ministry of Health & Family Welfare for the cost of running such MMUs/Vans and that the selection of areas where services by these would be offered, i.e., underserved clusters, unauthorised colonies and cluster of migrant population colonies. The response to these mobile van-based clinics was overwhelming, and there was high demand for services, by the communities. However, at this stage, the people who are conceptualizing this idea demitted the power. A year later in Feb 2015, when the political party returned to power with a thumping majority, the officials started thinking of rapid expansion of MMUs. At that point, the government officials realized that delivery of health services by MMUs is not only unpredictable and influenced by many external factors such as availability of vehicles, drivers, doctors, and road conditions but may not be sustainable in the long run, as well. Besides, the administrative and procedural complexities in purchasing a large number of vehicles and recruitment of contractual staff including doctors were considered limiting factors. The officials started looking for a suitable and sustainable alternative, and a few experts were consulted. Finally, after a few close room deliberations, the concept shaped as Mohalla Clinics got immediately support from top political leadership in the state. Accolades and appreciation for this model of healthcare have poured in from around the world since the inception of this system. US’ prestigious Stanford University, in its Social Innovation Review, has expressed appreciation for the Delhi government’s move to offer free primary medical healthcare through neighbourhood clinics, popularly known as Mohalla Clinics. The Strait Times, an English daily in Singapore found out that these Mohalla Clinics use fast and very advanced technology to carry out their work. The results of most tests are known within a few minutes. These test results are then uploaded on an IT cloud that can be accessed by doctors, patients, and their families. A Washington Post report suggested that “It may well be time for America to build “Mohalla Clinics” in its cities.”In December 2017, India’s renowned cardiac surgeon, Dr. Devi Prasad Shetty visited a mohalla clinic in Delhi and was floored by the healthcare services provided by the Delhi Government to the general public. Ban Ki-moon, the former Secretary – General of the United Nations, in his capacity as chair of the Elders, wrote a letter to Delhi Chief Minister, Arvind Kejriwal to show his appreciation of the system of “Mohalla Clinics.” Gro Harlem Brundtland, the former Prime Minister of Norway also commended this initiative when Satyendra Kumar Jain, the Health Minister of Delhi made a presentation explaining this model at a conference in Bangkok, Thailand. Brutland and Moon were on a tour of the country as part of a delegation from ‘The Elders‘, which is a collective of global leaders, set up by Nelson Mandela. They undertook a visit to one of the many “Mohalla Clinics” in the city during this trip. They were accompanied by Chief Minister, Arvind Kejriwal and Health Minister, Satyendra Jain. “I am deeply impressed by what I have seen,” Moon said and Brutland was of the opinion that this model should be replicated all over the country.”I’ve been to different parts of the world, but what I saw today is the best and most systematic form of healthcare in the form of Mohalla clinics and polyclinics. I’m touched and impressed by the efforts of the Delhi government. I hope there will be support and strong engagement at the Union government level also,” said Ban Ki-Moon.”Delhi government is grateful to Ban Ki-Moon and Gro Harlem Brundtland for visiting Mohalla clinics and polyclinics. They were impressed by how quality health care was being provided to the poor people of Delhi. The Delhi healthcare model is being appreciated across the world. A proud moment for India,” Kejriwal said. Currently, there are 189 functional Mohalla clinics in the city, and CM Kejriwal confirmed to the Elders’ delegation that they are planning to set-up another 1,000 in the coming few months.